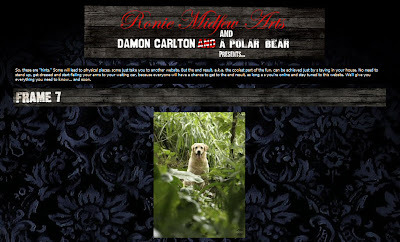 The first clue for Frame 7 is posted on the DamonCarltonandaPolarBear.com website. It is a picture of Vincent the dog who's real name is Madison, so perhaps we are looking for something in Madison Wisconsin (thanks Mel). Update - The screenshot comes from the episode Tricia Tanaka is Dead. Thanks to Roxanna for telling us first about the clue. Yea...That popped up around 3pm ET today...I came over to chat about it and all I saw was the countdown clock discussion. Everybody watchin college football today? Lol! Madison is also vinnies real name. Lotto ticket is looking into that. Great 1st clue...Bands and songs named and written about the famous motorcycle " Vincent"...etc etc. Can I just say that I really want a poster of just six letters? WAAALT! Has anyone considered Madison Square Garden ? I wonder if all the posters are going to be hard contemporary graphics like up to now, or if there will be any of a more classic style? Like say, even a nice abstract such as the Swan mural? Well the Skynyrd concert on the 1st would sure make up for the cupcake fiasco for NY fans. Madison Square? I dunno...I can't see them having another NY event so soon. But that is where they hold the Westminster Dog Show every February. and let's not leave out Vincent, Alabama! Lol! Actually Vincent has also been played by another dog called Pono. Anybody able to figure out whether it is Madison or Pono in the picture? I really hope the next poster is a Vincent one, I was going to get the Vincent poster if one was released, lets hope this one is. The screenshot is from the episode Tricia Tanaka is Dead. Wasn't that the first time we saw the Dharma Van ? Yea, it was also when Vincent got Ben's dad's arm. Maybe the URL's from that episode? Yes it was. When Vincent brought Roger's arm out of the jungle. Nachosaur had already said what I was going to. I need to go get my caffine. So far the clues haven't lead to what the poster is going to be or what the url is. But that doesn't mean it couldn't. Looks like this is going to be another tough set of clues. 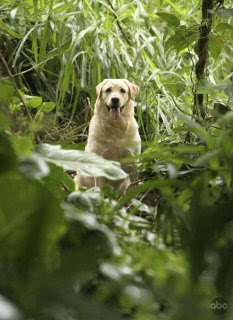 Vincent/Madison the dog in the jungle could mean anything. Something to do with Vincent/Madison. Something to do with dogs. Something to do with jungles or perhaps Hawaii or some other island. 1Miletogo, interesting, looking at the website it seems a little too upmarket for a Dharma van ! Does anyone remember the singer Don McLean? His biggest hit was 'American Pie.' He also had a hit titled 'Vincent (Starry Starry Night)' about Vincent Van Gogh. He will be playing in Natick MA on October 3rd. @dough: according to imdb.com, Madison plays Vincent in "Tricia Tanaka is Dead." Wow, a Vincent Van Gogh style poster of something islandy would be nice! There's a new clue up. Looks like a display of doggie toys. Maybe the reveal will be at a pet store somewhere? see it. I'll look here in Madison. ...a portrait of Dr Marvin Candle with his arm cut off?? is there an fair at lambeau field around the vince lombardi statue? New clue...Ventura Blvd street sign. 11600 block.